In this article we are going to see how can we run Jmeter tests using Jenkins. 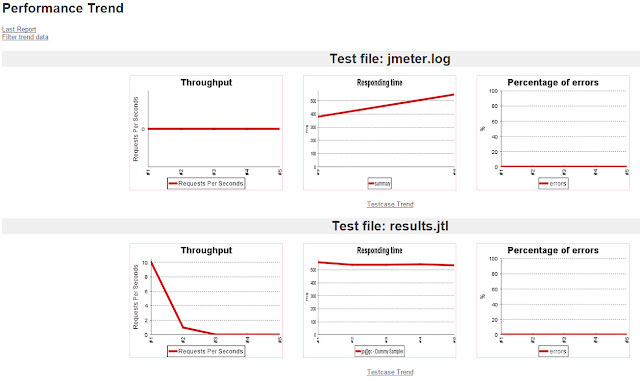 With jenkins we can run Jmeter in several ways. But, we only show the usages of Performance Plugins. Jenkins is a CI server. It runs processes. It has different ways to run process. Using its different plugins we can Run Jmeter in following ways. As we know we can run Jmeter from command lines(see my old post). So, we use this command to run in windows environment. 2. Add Several Jmeter reports Post build actions which will automatically show current results and Performance Trends. So, lets start. Step 2 : Open Jenkins in browser and go to dashboard. -Provide a Job Name , I gave "JmeterExample-Local"
Step 4 : Click Advance and select "Use custom workspace"
Step 4 : Click Add build Script Combo box and select "Execute Windows Batch Command"
This will show text box to add command. Step 5: Now, the important part. Using Performance Plugins Reports. Click Add Post-Build action combo box and select "Publish Performance test result report". This will enable a whole section to select different report. As this plugins include Jmeter and JUnit report types, we can see several type. For this blog, I have used only "Jmeter" and "JmeterSummarizer" reports. Select those report and provide file names. If you generate/save CSV format results, you can also select JmeterCSV report also to see. Step 6 : In Threshold section, I use this for accepted criteria like as follows. Step 7 : Save the job and run. Form running build if you see console , you can see where the results are saved by jenkins. Inside of the job(not dashboard) you will be able to see a new report, "Performance Trend"
If you click "Performance Trend" you can see this result dashboard. I hope dashboard charts are self explanatory. If you need to know details, comment please.